This final quarter in our Colour theme for our Four in Art group this year, the sub theme was "I've got the Blues" I guess this could be interpreted in a musical way or in the direction I have chosen, which springs more naturally to mind for me, working as I do in the Mental Health field. I've called my interpretation Rising Above the Blues. I wanted to let the blues sink down to have the lighter shades rise to the top; the nesting tessellating blues subtly meshing and becoming distinct, which alludes to the thoughts and feelings that structure our moods, blue or otherwise. The binding is a Carolyn Friedlander cross hatched charcoal and for the back I used good old Ikea Nummer print. After washing the texture really is highlighted. Is it really an "art quilt" I ask myself? What is an art quilt anyway? 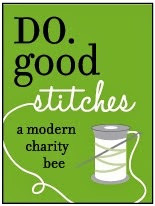 Maybe a quilted something trying to convey an idea is sufficient? I have been particularly busy at work this quarter so I'm glad I started early and did manage to finish in time, but the photos certainly leave something to be desired; so I shall update these in the very near future (not in the dark tonight!) to provide a better idea of this quilt. I love it. 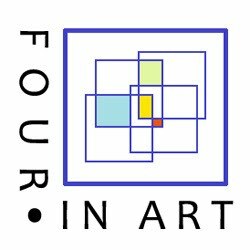 I have been wondering a lot too about what art is as relates to quilts, and I agree with you that conveying an idea is sufficient! I like the one conveyed by yours, and the crosses/pluses contribute to the idea of increasing 'positivity' as you rise up the quilt. Also, it's a thoughtful quilt but it's also very serviceable - I like that too! 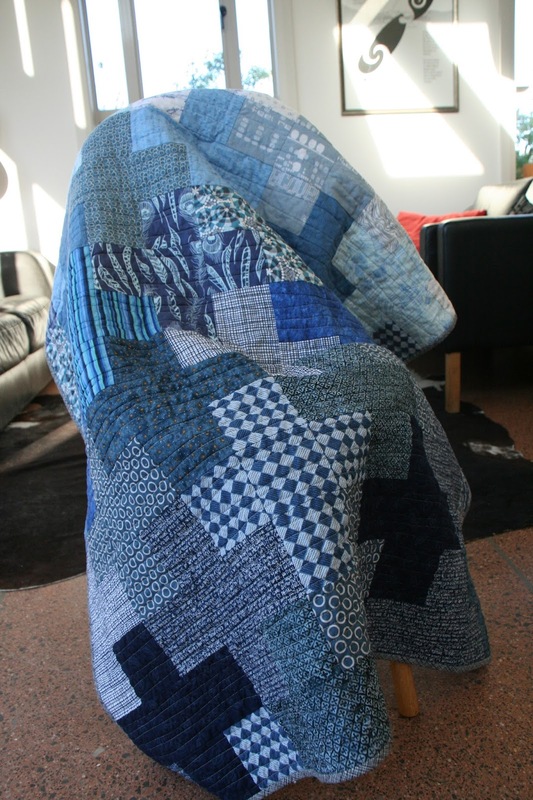 My first thought was "I'd love to wrap up in that quilt" and I'm not feeling blue! It draws you in and visually feels soothing. I love the size we started with (12x12) possibly because it's easier to tackle, but this usable size is awfully enticing! Great job. Lovely! So glad that someone else is going a bit larger, too. I think this is a great quilt and love the symbolism in the quilt. It is good to ask the question about whether its an art quilt. Aren't all quilts art? Its certainly a discussion that I see come around now and again. Brilliant over all! 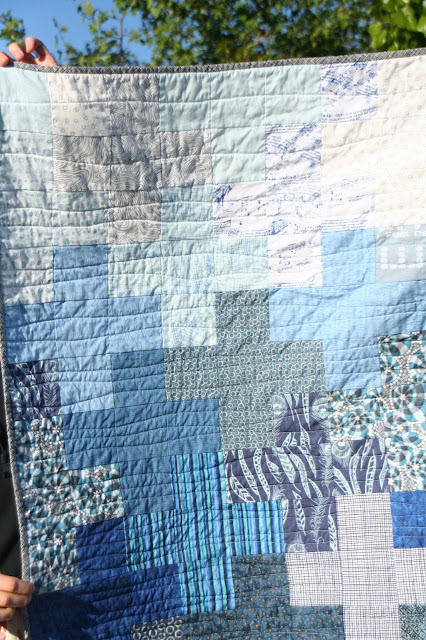 I think many of us have associations of sadness when we think of "blues," but I love the interpretation of your quilt--that hope will bring us to a lighter, less weighty place. I love the crosses intersecting, the color shifting in tonality as it rises. Well done! Love the quilt and your interpretation of the theme...similar to Susan's because of her relative. After I joined a support group ( for relatives of those with mental health challenges) to help me to help 2 family members and cope myself, I'm just blown away by how many others are ' in the same boat'. I love that you took the time to make a bigger Four In Art quilt. 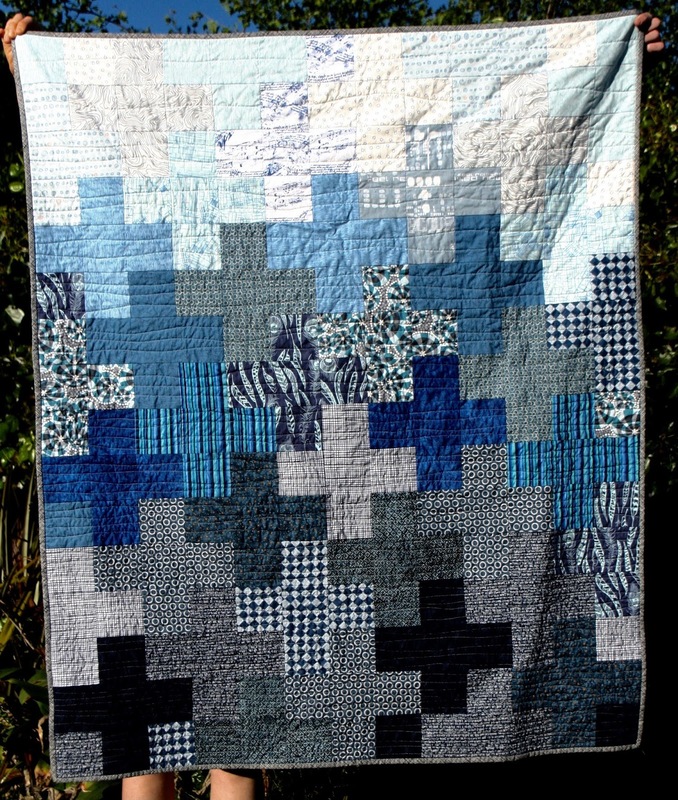 The gradation of the blues and of the quilting go hand in hand so nicely together. You quilt is very nice. It is artsy and also appears to be utilitarian. You explained your concept and process very well. You demonstrated how our quilting can also work to explain or make a statement. I look forward to your updated photos. Firstly my apologies for my tardiness at getting to viewing your lovely quilt Camile (I have been on vacation and had little Wifi...) It seems there is a common thread amongst the concepts this time around. Love the quilting on this and your interpretation of the theme.